1 Dell R410 Rack Server with 32GB of RAM, 2 x 500GB HDDs, and keyboard. SKU: LAB-NA-C-KW-NV. Category: CCNA Voice Lab Kits. Are you are looking to get your Cisco CCNA Collaboration certification and you want the best CCNA Voice Lab Kit but need to save some money? 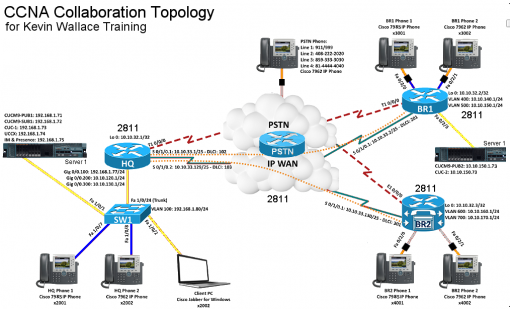 Then our CCNA Collaboration Advanced Lab Kit – Kevin Wallace (No Video) is your perfect choice! 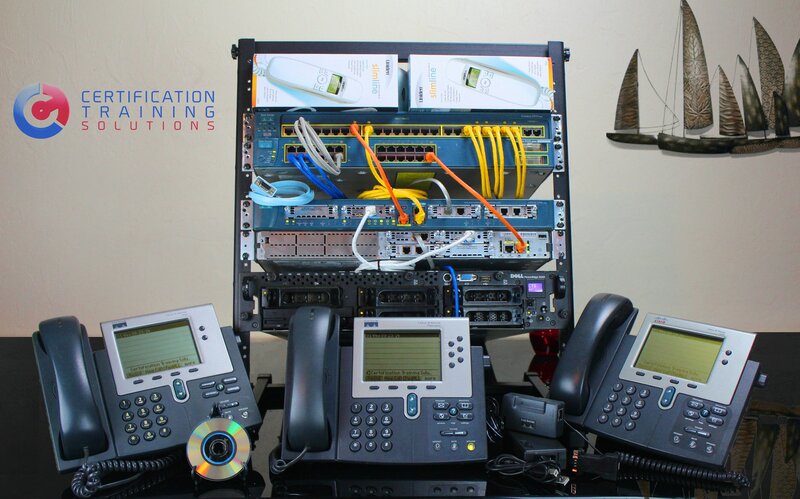 The CCNA Voice Certification (210-260 exam) covers many topics including CME (Call Manager Express), CUCM (Cisco unified CallManager), CUE & Unity (Voicemail) CUPS (Cisco Unified Presence) and more. We include all the (demo license) Cisco software you need to learn CUCM, CUC, CUPS, SDM, CCP, Cisco Communicator and others with your purchase of this Lab Kit. We also provide you with backup copies of the Cisco IOS’ plus additional software including a TFTP server and other utilities. 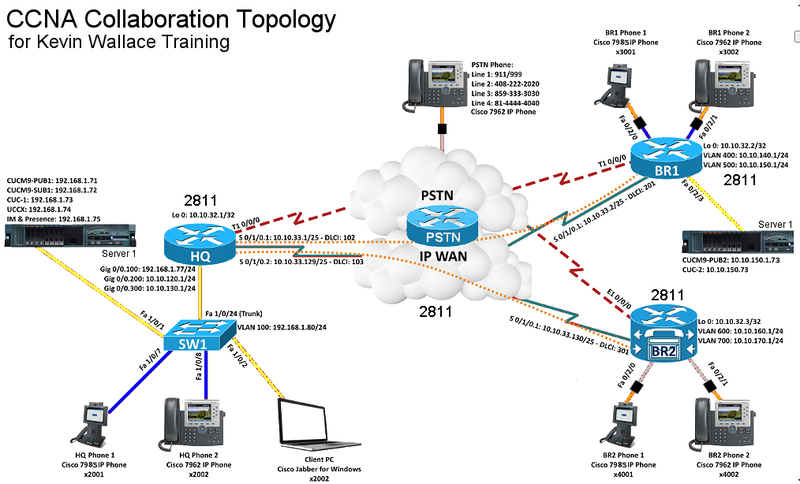 After working with CCIE Kevin Wallace, we came up with an affordable CCNA and CCNP Collaboration Lab Kit to use with Kevin’s CCNA and his CCNP Collaboration on-line course. In Kevin’s course he recommends using Cisco 2911 routers, ISM-SRE-300-K9, CUE 8.6 installed, and Cisco 9971 video phones. While these items do offer the latest features and benefits, they also come with a very high price tag too. Although you may not have all of the features of those, Kevin assures us that our lab kit design will work for the CCNA and CCNP exams but he stresses that you do need the more current equipment for the CCIE exams. To save you a few hundred dollars we have all of the right equipment for Kevin Wallace’s course so that you can pass both exams, we removed the video phones from this Lab Kit. If you are planning on going for your CCNP Collaboration certification, this Lab Kit is NOT for you! You will need video at the CCNP level. We start with four 2811 routers with 512MB RAM and 512MB Flash RAM running IOS 15.1 Advanced Enterprise which has Call Manager Express 8.6 already included. 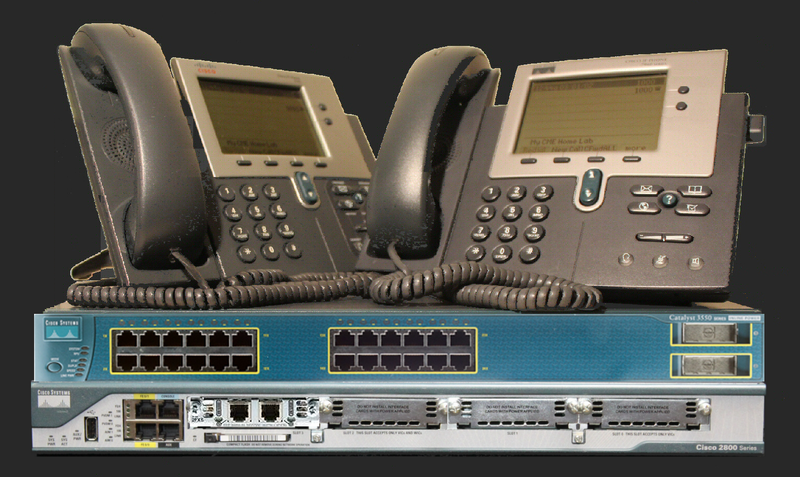 The four routers are used for the HQ, BR1, BR2 locations and one as the PSTN simulator. The PSTN router also includes a PVDM2-32 and the other routers have a PVDM2-16 Digital Signal Processor chip a WAN card and a Voice/Data card. BR1 also includes a WIC-9ESW-PoE switch card and an AIM-CUE voicemail/auto-attendant card. 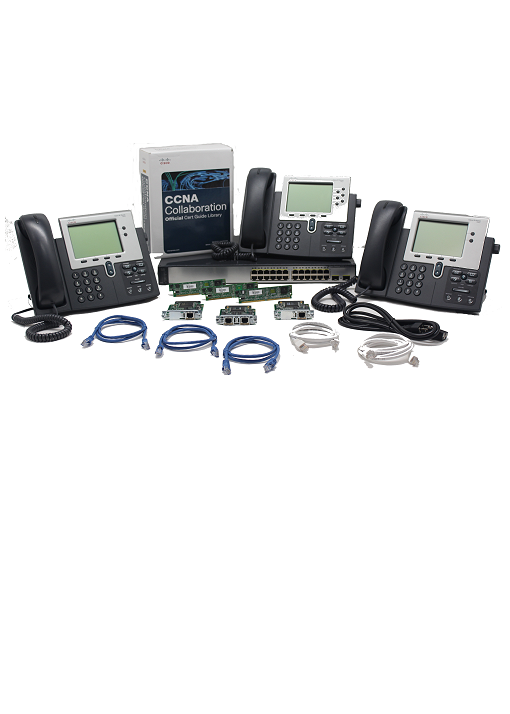 The HQ branch includes a Cisco 3750-24-PS-S switch running IOS 12.2 and provides power to the IP phones too. A Dell R410 (or better) server with 32GB of RAM and two 500GB hard drives and is loaded with a copy of VMware 6 as well as all the Cisco demo software before we ship it to you. VMware is loaded and run on the server so you can then run CUCM and CUC at the same time on the same box. We also provide you access to backup copies of all the Cisco demo software, Cisco IOS’, and other programs on our download site. The topology diagram shows two servers but with 32GB of RAM, you can run three copies CUCM for each site and the server has two NIC cards too. Just one server for two sites! You can also get a VoIP provider that provides a SIP (Session Initiation Protocol) and make calls over the Internet for a very low cost. We can provide you this service too! CCIE Kevin Wallace suggests using Cisco 7965 color IP phones at all sites but agrees that 7962 monochrome IP phones will work just as well and will save you money too. We cannot use 7960 or 7961 phones as they handle caller-id differently. For video phones Kevin recommends Cisco 9971 video color IP phones. Once again the cost of these phones is very high. Plus, they require the use of 2911 routers with PVDM3, DSP’s, and HWIC cards too. All causing the price of a lab kit to be sky high. This is why we include the Cisco 7942 and 7962 monochrome IP phones in this lab kit. These phones save you money while meeting the needs of a CCNA level of certification. Your training is provided by the CCNA Collaboration Official Cert Guide Library book set which includes the two books: CCNA Collaboration CICD 210-060 Official Cert Guide and CCNA Collaboration CIVND 210-065 Official Cert Guide. 1 Dell R410 Rack Server with 32GB of RAM, two 500GB HDDs, and keyboard. Dell 1950iii Server; 100-240VAC auto-switching 2.2A average.